It’s Carnival of Genealogy (CoG) again, the monthly opportunity for genealogy bloggers to ponder a specific topic -- and for April it’s cars. Thanks to Jasia at Creative Gene for hosting CoG. Blitzbuggy. For those of you who remember your World War II history, the term “Blitzkrieg” (Lightning warfare) may come to mind. Blitz means lightning in German, and knowing my dad, I’m sure irony came into play in naming this iconic automobile. 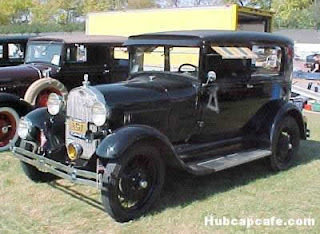 Blitzbuggy was my Dad's family's 1929 Model A Ford. Blitzbuggy was special. My parents spoke and wrote about her as if she had a personality. She was maddening and endearing. She required pampering, cajoling, and endless tinkering, yet held her owners in thrall. My parents told stories about her breakdowns as if relating the escapades of a spoiled child, who, no matter how much trouble she caused, was unconditionally loved. Perfect on each and every score. Carried her right through the door. But Blitzbuggy would also be the conveyance for a beginning that was far less joyous than my parents’ wedding and one that I wouldn’t have known about until I found this out-of-focus photo tossed in among our collection. 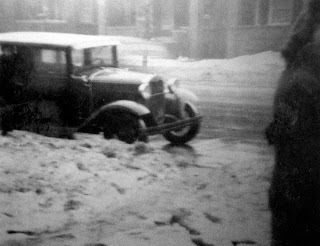 Coming upon it, I saw only an unremarkable old car parked on a snowy street, with no identifiable people. Until I turned the picture over, and read my father’s detailed notes on the back, I never would have known the critical event this photo documented. 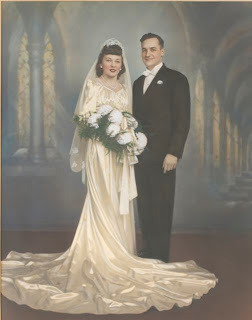 Frank Ebner, (ABE-ner) Gartz, born May 14, 1924, was my Dad’s ten-year-younger brother and my grandparents’ youngest son. His middle name was taken from my grandmother, Lisi’s, maiden name, one you’ve read in numerous past posts. At eighteen years old, Frank was about to start his training to become a navigator for the Army Air Corps in World War II, and Blitzbuggy brought him to sign up for the service just a few blocks from the family home. It’s a familiar winter scene for the city: the snow is piled on the sidewalks, and typical Chicago greystone apartment buildings form a backdrop. The entire atmosphere of the photo--its blurry focus, the gloomy, colorless weather, the faces of the two women in the photo hidden or indiscernible, the lone black auto on a strangely empty street--create a visual metaphor for the emotions of a family about to send its youngest off to war. 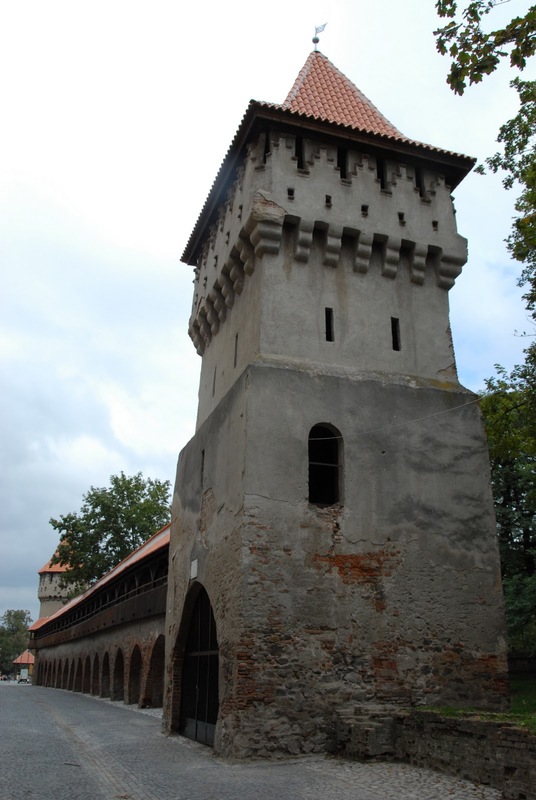 When we took a brief visit to Sibiu (Hermannstadt to the Germans), we marveled at the massive wall surrounding the city, its combination of thirty-nine towers and four bastions a bulwark against invading Ottoman Turks. But while Sibiu defended the city in the past against those bent on its destruction, it is now dedicated to protect its Saxon German heritage for future generations. Although few ethnic Germans still live in Sibiu (a combination of mass deportations after World War II, brutalization under Ceausescu’s rule, the 1989 Revolution, and other factors, coupled with Germany's generous immigration policy for ethnic Germans), it is still a major cultural center and home to a wealth of Siebenbürgen German history. (Click to get an overview). After visiting Grandpa Josef Gärtz’s church in Neppendorf, we drive a scant two miles to Hermannstadt/Sibiu to visit the Friedrich Teutschhaus, a repository of Saxon German history. 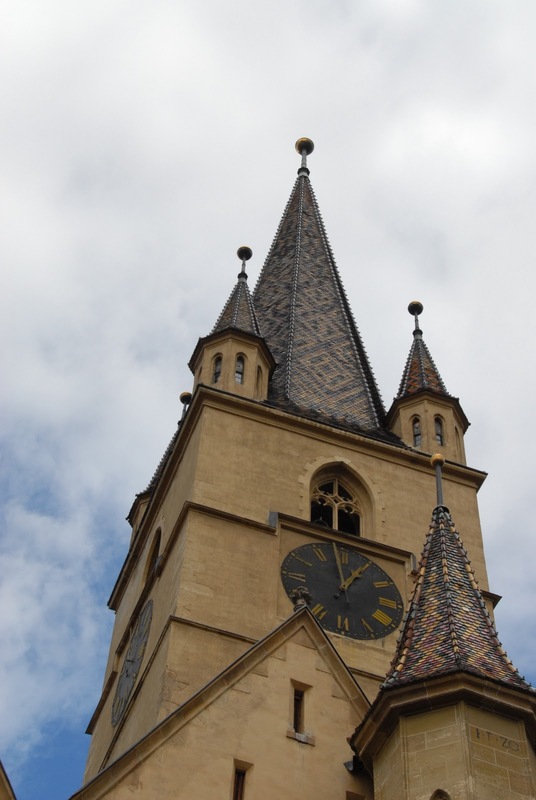 It’s aptly named for a long-time Evangelische Lutheran bishop, Friedrich Teutsch, who worked tirelessly to preserve Transylvania’s German culture. 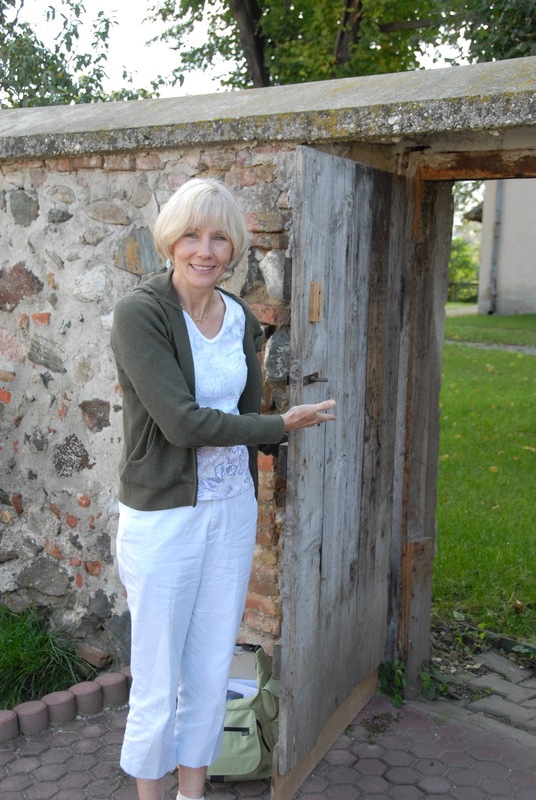 At Teutschhaus we hope to track down the home in which Grandma Lisi Ebner was raised, called the “Ebner Hof.” The Ebner family lived in the nearby town of Grosspold, about 15 miles from Hermannstadt/Sibiu. Cousin Maria had arranged for us to meet the venerable Teutschhaus researcher, Herr Rehner, to help us with our quest to find the Ebner Hof. Over six feet tall, with a shock of white hair and gentle gaze, Herr Rehner leads us to a back room where ancient Saxon records line the shelves. Using my great grandfather’s name, research assistants efficiently stride to a back room and within ten minutes bring out a worn ledger of former Grosspold residents. Herr Rehner turns the pages to “E” and finds my great grandfather’s house number. “Ebner, Samuel—365.” The town was small enough so that every house had its own number, rather than a number and street name as we’re accustomed to. in book of house numbers. Next stop—Grosspold. We meet Pfarrer Meitert, present pastor of my grandmother’s church. 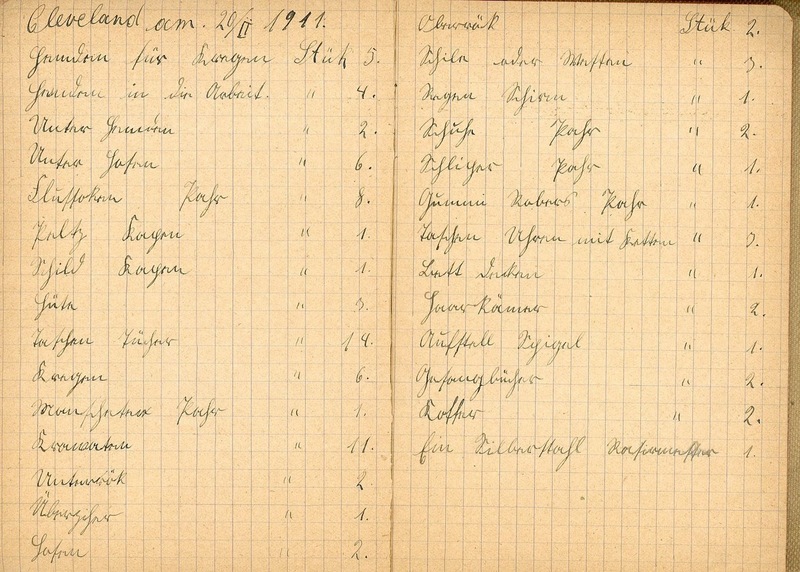 Using the house number, he pages through a two-hundred-year old “Familien Buch” in which the birth, death, and marriage dates of each family member are recorded. I initially wrote about this discovery in more detail in an earlier post: Life and Death Abbreviated and the sad truth the Family Book revealed: three of my grandmother’s siblings had died as mere babies. 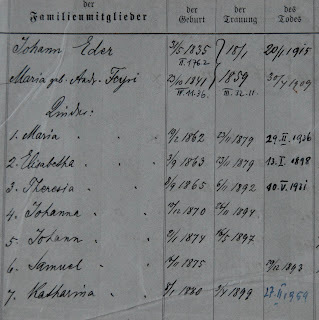 The book recorded the exact death date of my grandmother’s mother, also named Elisabetha Ebner, born Eder. 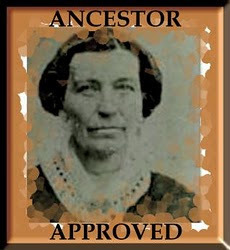 She had died of pneumonia at the age of thirty-four, when my grandmother, (nicknamed) Lisi, was only ten years old. Family History Book: columns l-r: "Family Member,"
But the book took us even further back into the past. 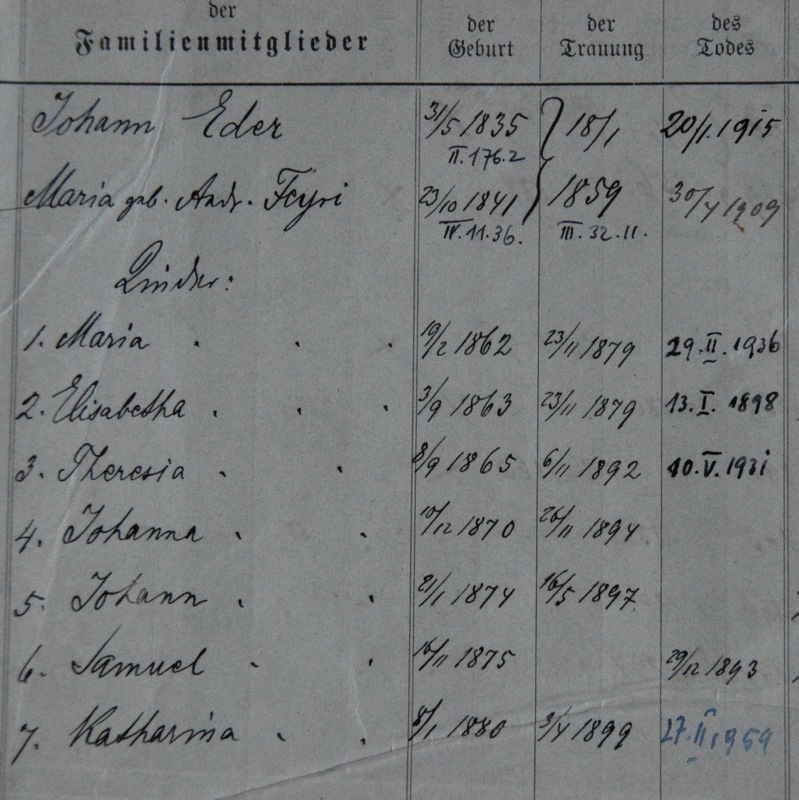 Cross-referencing, we found the page recording the information for my grandmother’s mother’s siblings and parents: the Eders. 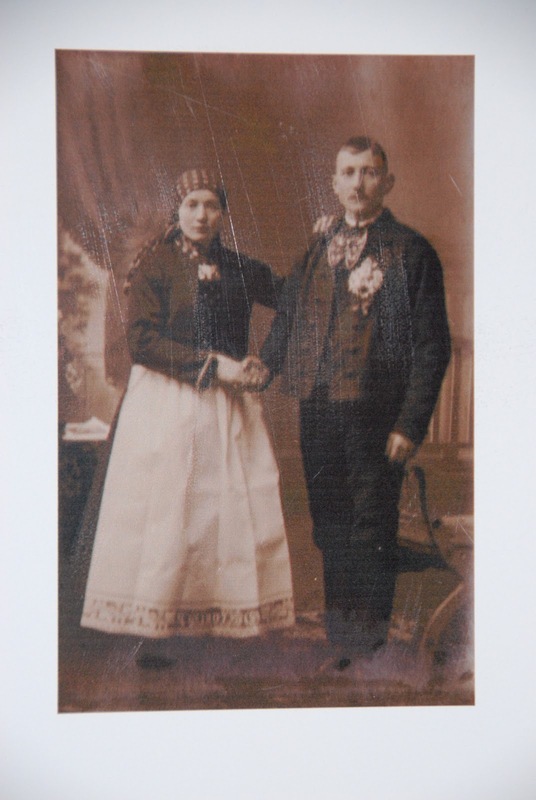 Johann Eder and his wife, Maria (born and 1835 and 1841, respectively, and married in 1859) were my great-great grandparents. They had seven children, all of whom survived the most vulnerable infant and childhood years, but still, death came relatively early for two of the children: Elisabetha at thirty-four and Samuel, the second youngest, died at eighteen. After gathering this information, what happens next is extraordinary. Pastor Meitert carefully removes the Ebner pages from the centuries-old Family Book, folds them under his arm, and declares we’re going door-to-door in Grosspold until someone can tell us just where House Number 365, the Ebner Hof, is located! 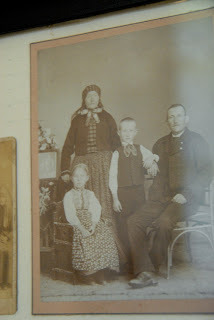 In two previous Travel Tuesday posts, I wrote about my brothers and my visit to the small museum at the back of my grandfather Josef' Gartz's Neppendorf church, where we were astounded to find copies of our very own family photos representing daily life in Josef's home town (Spilling Secrets), as well as photos of our famous bandleader cousin, Michael Gärtz. After the church, our next stop was the “big city” of Hermannstadt ("Hermann's City,") founded by Hermann of Nuremburg in 1150), just a few kilometers distant from Neppendorf. It's called Sibiu by the Romanians; Nagyszében by the Hungarians. A beautiful medieval town, it is one of the “seven fortresses,” or walled cities, that make up the area of Siebenbürgen/Transylvania. It is also the city where my grandmother, Lisi, worked for Mrs. Jickeli, whose family owned a successful hardware store on what was then called "Der Grosse Ring," the Great Ring, but has been renamed Piața Mare, one of Sibiu's three main squares. For centuries, Sibiu was one of the most important towns in Saxon Land. It’s been declared a Unesco World Heritage Site and the year we visited in 2007, had been chosen as European Capital of Culture. Sibiu’s old town comprises three recently re-cobbled squares called Piațas (pronounced “piazza"-- the Romanian language is very similar to Latin). In fact, just about every town we visited in Romania, major infrastructure improvements were underway, old cobbles being torn up and replaced to update underground sewers. It was a country trying to catch up. In Sibiu, the Evangelical Lutheran Cathedral. with its pointed spire soaring up to seventy meters, dominates one of the smaller squares, Piața Huet. Surrounding the main tower are four shorter turrets. Just like my grandfather’s church in Neppendorf, this one had also been originally Catholic until the Reformation. The church is a beautiful, soaring Gothic structure built between 1300 and 1520. Even the notorious Vlad the Impaler (see post, The Real Dracula) has a representative of his family entombed in this church: his son, Mihnea Vodă cel Ruă (Prince Mihnea the Bad--is that moniker any surprise?). He’s in a closed- off section behind the organ. We didn’t ask for entry, but visitors can. Besides its peaceful light-filled ambience, a highlight of the interior is a superbly restored gigantic fresco (over nine meters high) painted in 1445 by Johannes of Rosenau. Outside the entrance stands a statue bronze statue in tribute to the renowned Bishop, Georg Teutsch, a strong advocate for Transylvanian Saxon culture. 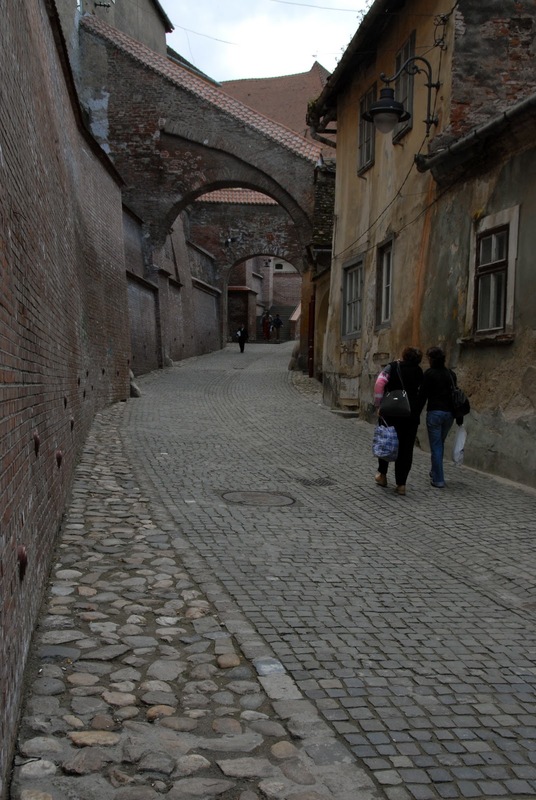 Sibiu is a joy to walk. Sleepy eyelid windows peek out from rooftops, as we walked past pastel-painted, single-story homes nestled together on side streets or down ancient, cobbled narrow byways. Southwest from Piața Huet and the Lutheran Church on Str Mitropoliei stands the 1906 Orthodox Cathedral, a smaller version of Istanbul’s Hagia Sofia. We saw orthodox priests in their distinctive black robes and hats conversing on the sidewalk in front, a sign of the city’s diverse histories. But for me, the stand-out feature was the city walls, the existence of which lends the name Siebenbürgen (seven fortresses) to Sibiu and its six other Saxon-land counterparts. These imposing stone walls, interspersed with 39 towers up to sixty-four meters high, encircle the town, a bulwark critical in centuries past to shield its wealth from Turkish attacks. It still stands as a physical reminder of the constant state of vigilance under which the Saxon Germans had to live. maintained by a different guild. Just as Sibiu protected its Saxon inhabitants from invaders for hundreds of years, the city now guards the Siebenbürgen German's history for future generations. In the next Travel Tuesday post, we’ll visit the historical archives of the Transylvanian Saxons, where an ancient ledger held the key to finding my grandmother, Lisi’s, home in nearby Grosspold. 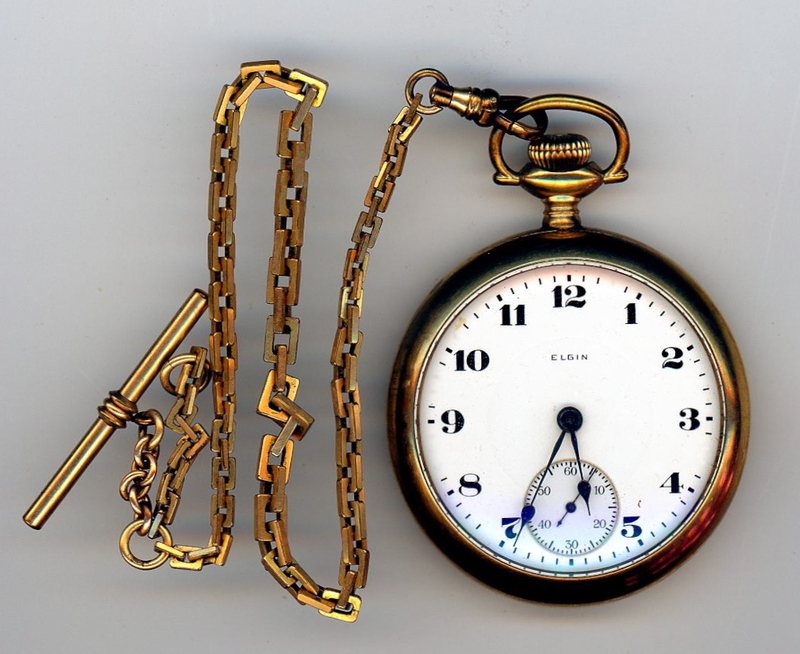 The pocket watch lay in Box 14 for the past seventeen years--and untold decades prior--in my grandparents' cedar chest. I had assumed it was my grandfather’s watch, but didn’t know when he had acquired it. Its wide, crisply-numbered face and long gold chain made me wish I had a small pocket in which I could carry it, so I could take it out on occasion to look at the time, just like in the old movies. But that was impractical, if not impossible. I’ve come across this watch numerous times as I’ve revisited Box 14 to confirm a date, find a letter, marvel at all my grandmother saved. 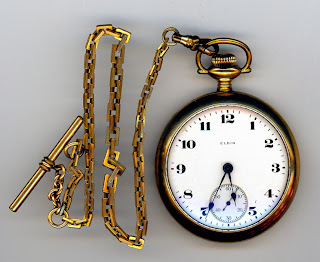 But recently I’ve discovered a previously unknown document that makes the pocket watch even more precious. More on that later. Also housed in Box 14 is a collection of German song books. 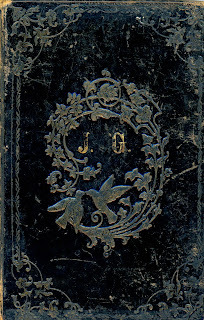 Embossed on the front of one are my grandfather’s initials (“J.G." for Josef Gärtz). 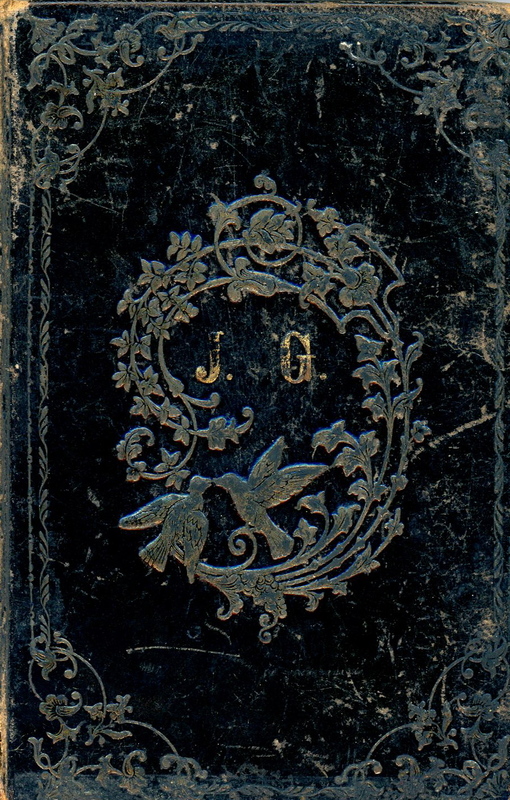 It is actually a church hymn book, for the title page reads (in translation): The Song Book of the Evangelical Community Church in the Siebenbürgen section of Hungary. But what has brought these items to discussion on this post is a connect-the-dots sort of discovery that imbues these objects with extra meaning. I have written in a previous post ("Crossing in Winter") that Josef had made his last diary entry about his trip to America, when he described the brutal winter Atlantic crossing he embarked upon on New Year’s Eve, 1910. But he actually did write in the diary again--two months later. After arriving in America on January 11, 1911, Josef traveled to Cleveland, Ohio, where he met up with a family from his home town of Neppendorf. He made one more entry, dated: Cleveland, February 20, 1911, a century ago. It was a packing list. Given he had written it more than a month after his arrival in America, I can surmise one of two things from this list. Either he had carried these items along on the ship and decided a month and a half later to simply write down everything he had brought or, perhaps, he had shipped them separately and recorded them as he unpacked. I’m inclined to believe the latter because of the quantity of items and the weight. He was a carpenter, so it was essential to bring along tools of his trade if he were to earn a living, and this list proves he did just that. Upon reading it, I had an “Aha” moment. Perhaps you, like I, can look at this list and try to imagine what you would choose to start life anew in a 5,000-mile distant land, probably never to return home. Most importantly, that shiny gold pocket watch had new cachet because it is an artifact from Josef's origins, a constant reminder to him of "home." 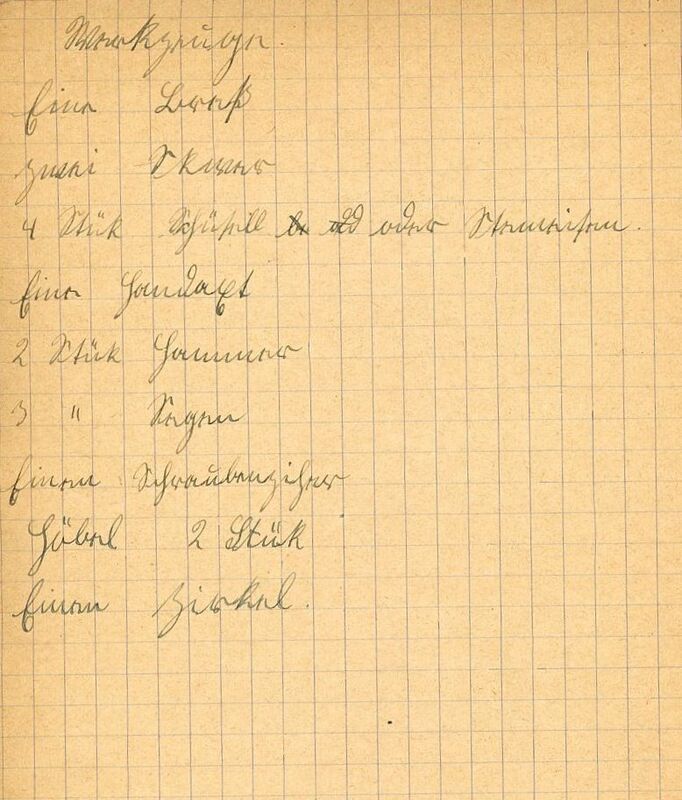 And although I knew the song/hymn book originated in Siebenbürgen, its pedigree and connection to our family’s past is made all the more real by seeing its inclusion on a list, written in his own hand. 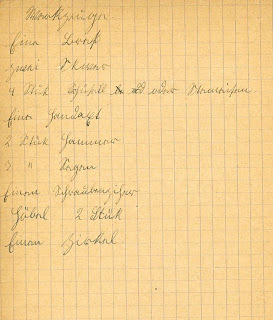 Here’s the translation of Josef’s packing list, not necessarily in the same order, compressed for space. time to turn his attention to persuading the love of his life, Lisi Ebner, to join him. Their 100-year-old letters, coming up, show us how it was done. 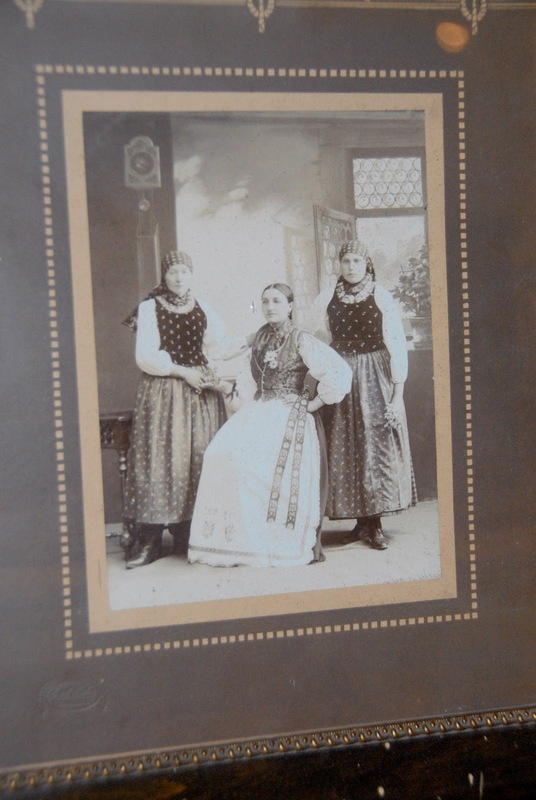 When we walked into the small museum at the back of my grandfather’s Lutheran Church in Neppendorf (near Sibiu) and found photos of my grandmother and grandfather’s sister on display, we realized how interwoven our family history was with this community. The same images we cherished in our own collection at home were here, 5,000 miles distant from Chicago, helping others to understand the culture of the Siebenbürgen Germans. (See last Travel Tuesday Post: Spilling Secrets). But the museum highlighted a Gärtz my brothers and I had never known. 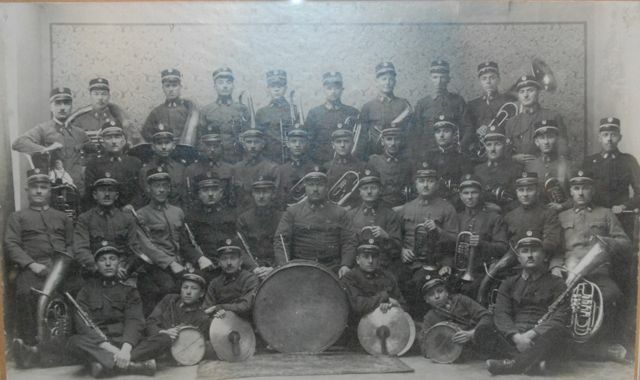 Although Josef Gärtz had struck out for America in 1910, the family of his half-brother (born in 1867) stayed for the next 70 years in Neppendorf, where the Gärtz name became inextricably bound to the town’s famous marching band. The church museum dedicates several displays to the band, including this one with instruments, uniforms, and a 1925 photo, entitled Neppendorfer Neue Musikkapelle, The New Neppendorf Band (see above). No man is more associated with this famous band than my grandfather Josef’s, nephew, Michael Gärtz. He was the son of Josef’s twenty-two-year-older half brother. Born in 1893, Michael was a mere four years younger than his Uncle Josef. You’ll see my grandfather’s nephew, Michael Gärtz, in the photograph bottom row, third from left, at the age of thirty-two. Michael was drawn to music at an early age. 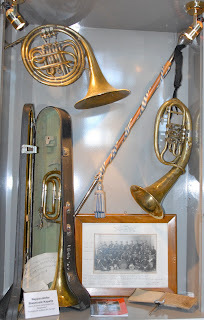 The twentieth century was barely new when, at the age of nine, he joined the Neppendörfer Blaskappelle (brass band), first playing the drums, then the Flügelhorn, an instrument similar to a trumpet. The band was an integral part of the community, playing at weddings, festivities, holidays, and parades. Michael rose to become one its longest-serving leaders. Just one year after the group picture above was taken, in 1926, he was made conductor, a position he held for the next forty-five years. At the end of the Second World War, about 75,000 ethnic Germans were deported from Transylvania to Soviet labor camps. In 1946, Michael Gärtz’s job was to revitalize the band and somehow bring spirit back to a community that had lost virtually an entire generation. See photos and hear music of the Neppendorf Marching Band on You Tube. This seemed a pretty good clue that this was the ship that brought him to America, as he had not noted a different ship's name anywhere else in his diary. 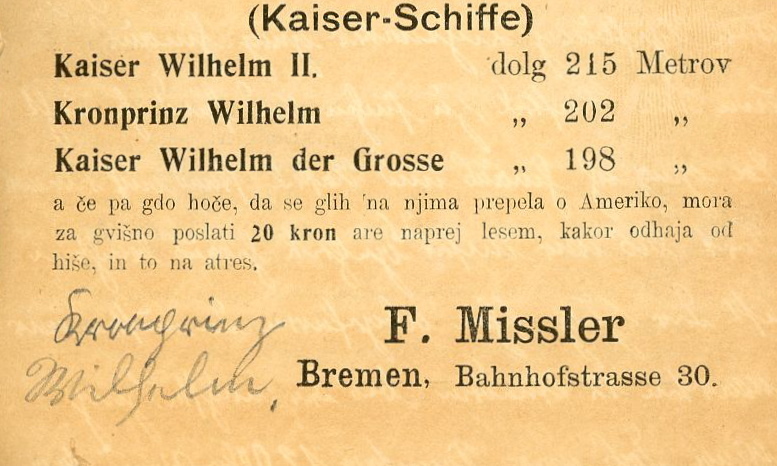 However, as I had originally posted, I could not find his name on the manifest (list of passengers) for the Kronprinz Wilhelm, which had arrived on January 12, 1911, a logical arrival date for a ship that had left, according to his diary, on December 31, 1910. I also tried searching any ship around that time, thinking perhaps we had the wrong ship. I tried entering just the “sounds like” for his name, but included his birthdate as 1889, give or take a few years. No luck. name found on this ship's manifest. 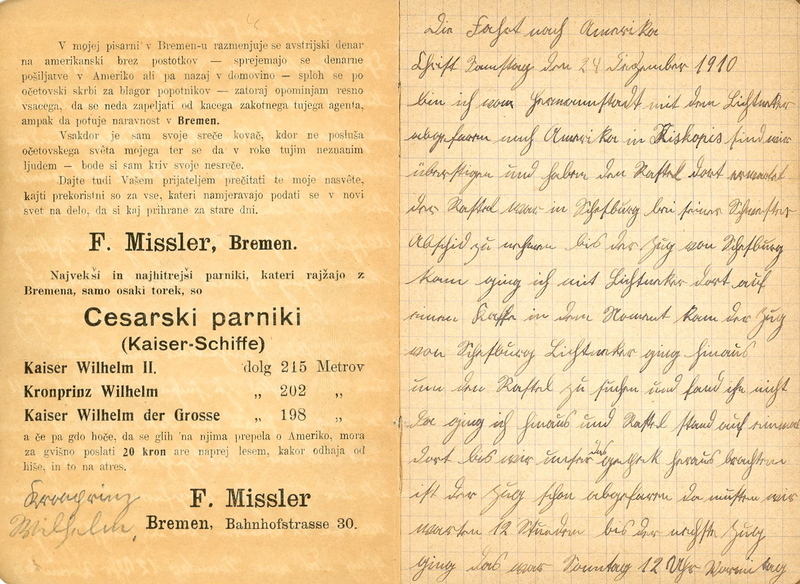 Recently, through the German contact that helped me decipher my grandfather's diary from the old “Gotisch” German, I was put in touch with Monika, a woman whose specialty is researching immigrants from the Siebenbürgen area to North America. She has looked for hundreds of names on ships‘ manifests, and knew the pitfalls. She said she also prefers the Steven Morse site (vs. the Ellis Island site) to search for ship manifests. When she noticed I couldn’t find my grandfather’s manifest, she searched and found it! 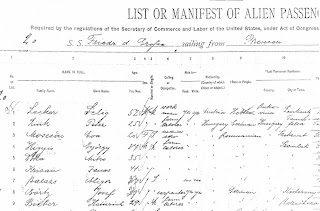 As she said, “The problem is that the transcribers [of the original handwritten documents] came up with the most outlandish spellings in the indices at Ellis Island (and at any of the ports). It took more imagination to come up with what they did than to read what was in front of them.” Of course we are searching what the transcribers for the data base thought they read--not what was actually written. Manifest for "Friedrich der Grosse, sailing from Bremen"
In my grandfather’s case a couple of errors. First, his name was transcribed as “Gortz,” a misreading of the name that is understandable--it could be “o” or “a” as handwritten. But the real goof-up came with his age. The manifest had originally noted his was “29,” but then sloppily corrected his age, rightly, to “21.” The transcriber missed the confusing correction and miswrote his age as eight years older than he was. I didn’t search for that wide of an age difference. 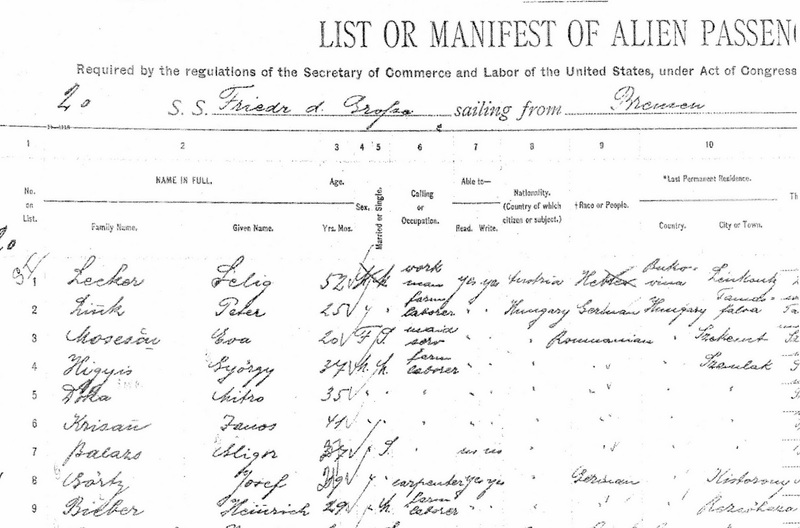 Looking at the manifest for the ship, Friedrich der Grosse, which arrived in New York on January 11, 1911, I’m able to find my grandfather’s name on line #8. Why this ship did not come up in my original search for any name sounds like “Gartz” (and even when I searched for "Gortz" the program didn't find him) is not clear. 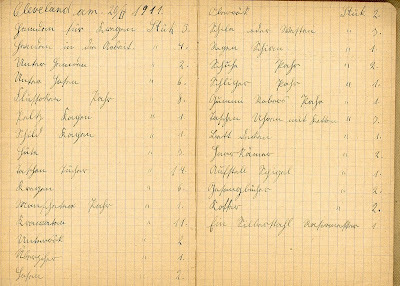 What is clear is that #8 on this manifest is my grandfather, Josef Gärtz: Age: 21 (corrected); occupation: carpenter; Nationality “German” Last permanent residence: “Kistorony” (the Hungarian name for Neppendorf); destination: Cleveland, including the address there of the friend who was to meet him, Gottfried Nuss. I’m very grateful to Monika for her expertise and help in solving the mystery of the missing manifest, and to know now which ship Josef travelled on. I’ve corrected my previous posts to reflect the accurate information. Come, enter with me into the courtyard of the Evangelische Kirche Neppendorf. We’ve been here before -- and learned when and from where (late 18th century and Gerstheim, Alsace, respectively) our forebears made their way to this little German community that became home to the Gerz/Gärtz family for nearly two centuries. Like all families, they faced their share of trouble and tragedy: poverty, illegitimate children, death by sometimes tragic means. But tucked into the back of the church, a small museum celebrated the good things in life: the communal spirit and optimistic outlook of Neppendorf and Siebenbürgen residents. It was an ethic based on the belief that anything is possible--if you’re willing to work for it. We also discovered a stunning and unknown connection between our own family and this museum. At the top of a small flight of stairs, Renate, the church secretary who had been our guide to our family’s genealogical history in Neppendorf, pushed open a heavy wooden door, revealing a small, neat, brightly lit museum of German life in Transylvania, and Neppendorf in particular. I felt immediately at home among the familiar--looking artifacts: musical instruments, furniture, books, and needle work in the same style my grandmother created, thick black or red embroidery on white woven cloth. I’d lived in Germany for a year as a college student and yet never felt as if I’d “come home” as I did here. The walls were lined with photos, displaying Neppendorf weddings, families, individuals, the town’s celebrated band, the rebuilding of their church. As we pondered the wedding photos, brother Bill paused, his eyes widening. “Wait! Isn’t this Grandpa’s sister?” Cousin Maria and I stared. Sure enough, Katarina Gärtz and her bridegroom, Josef Huber, stared back at us across the past century, posing in their wedding finery, holding hands, in 1912. As we made our way around the room, shouts of recognition continued. In this little church museum, 5000 miles from our home in Chicago, we discovered three photographs that we recognized from our own family collection. 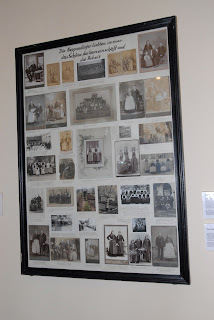 Had we not come, we never would have known that our family’s photos help tell the story of the Siebenbürgen Germans in Neppendorf! On this wall we found a photo of my grandmother posing with Katarina Gärtz, Josef’s sister, and Sara Reisenauer, his cousin. It's the same photo my parents had included in a family history photo album they had made for us kids in 1984. But it wasn’t until almost three years after this visit, when I was able to decipher and translate the missives between my grandparents, that the previously-unknown significance of this iconic photo emerged from the pages of a long-buried letter. Stay tuned for that stunner, coming up as we follow the correspondence between Lisi and Josef. corner. Close up below right. It doesn’t mention “fun,” and I think I know why. I feel pretty confident that working people of that era didn't pursue “fun” as relentlessly as so many do today--as an end in itself. First of all--there wasn't time. But humans need fun--so it was delivered by working together--as part of a community, creating beauty--in their gardens, their needlework, their craftsmanship, their churches, their homes, their singing-and then reveling in their creations. Yes, life was harder, illness and death ever-present, but perhaps without directly seeking “fun,” they found it in the pleasure of the every-day, and with it, satisfaction--whence they derived happiness. And more discoveries were to come, including our family’s role in the musical life of the town. 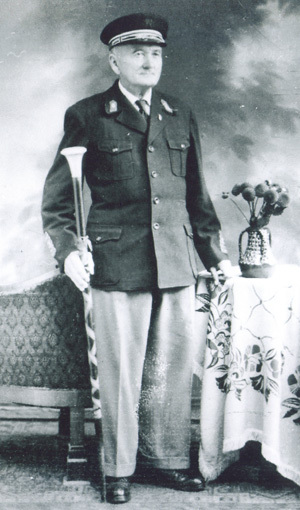 The Gärtz known as the “John Philip Sousa” of Neppendorf helped bring the town joy and renown after the devastation of war. Next up on Travel Tuesday.